Adele released her follow-up to 2011's blockbuster 21 with 25 and she's continued to dominate both in sales and on the charts. Her lead single "Hello" became the 24th song to debut at No. 1 on the Billboard Hot 100 songs chart and parent album released Nov. 20, 2015 opened at No. 1 on the Top 200 Albums chart with a record breaking 3.38 million copies sold in its debut frame. It would go on to sell over a million copies in the following two weeks, a feat no other artist has done since Nielsen began tracking point-of-sale data in 1991. In its first three frames, 25 sold over 5 million copies. Now as 2016 has come to a close, Billboard has named her the top artist of the year based on her performance on charts. Adele's 25 spent 10 weeks at the top of the albums chart spanning into the first quarter of 2016. Even in that tenth sales week, she was able to move an additional 81,000 copies adding to the total, a number that many artists nowadays may reach in their opening week. 25 was released exclusively as purchase only rather it be the entire album or track downloads. It took seven months before the Grammy Award winner let the music be streamed on services such as Spotify and that prompted the album to return to the top 10 thanks to streaming units and the single "Send My Love (To Your New Lover)." In fall 2016, it was certified Diamond by the RIAA. "Hello" as noted debuted at No. 1 on the Hot 100 as the 24th song to open at the top. It moved a record breaking 1.1 million digital downloads, and had 61.6 million streams total while having 73 million impressions on radio. It would also spend 10 weeks at No. 1 while staying at the top of Adult Contemporary for 21 weeks, tying with Kelly Clarkson's "Breakaway" and Céline Dion's "A New Day Has Come" for longest run. 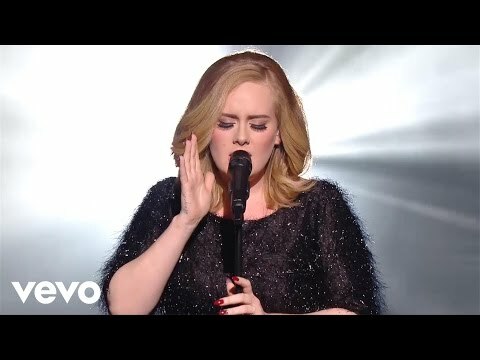 "Hello" ends the year at No. 7. The next single "When We Were Young" didn't have the success on mainstream as it wasn't geared toward the format, it did manage to become Adele's second No. 1 on the Dance Club Songs tally. In May, "Send My Love (To Your New Lover)" was released and the video to accompany the song was simple yet trippy. It became her fifth song to lead Adult Pop Songs and fourth on Pop Songs (Mainstream Top 40). Adele had the honor of being named one of TIME's most influential people in April and her tour was largely successful as well. Ending in later 2016, it grossed $150 million while playing 122 shows across the globe. It's ranked No. 4 on the top tours of 2016 list.